Adult marbled murrelet in breeding plumage. Pacific Southwest Research Station, U.S. Forest Service. The marbled murrelet is a robin-sized seabird that inhabits shallow coastal areas from the Aleutian Islands of Alaska, south to central California (Figs. 1, 2). In breeding plumage, adults are cryptically colored in brown with white “marbling”; hence the name. Marbled murrelets have the unique behavior of foraging in marine waters and flying inland to nest in large conifer trees. Nesting behavior has been detected as far as 88 km (55 mi) from the ocean in Washington (Figure 2; WDFW Marbled Murrelet database 2012). Murrelets nest mostly on large branches or other suitable platforms in large trees (Hamer and Nelson 1995, Nelson 1997, Ralph et al. 1995), with a preference for mature and old forest in Washington, Oregon, and California (Nelson et. al 2006). The species is unusual among alcids (i.e. family Alcidae which includes auks, murres, and puffins) in that it does not nest in colonies. The small size, dark coloration, and fast flight speed during low ambient light make marbled murrelets difficult to observe during their flights over land. Because of their cryptic behavior, the first documented nest in North America was not described until 1974 and no nesting location was confirmed in Washington until after 1987 (Leschner and Cummins 1992). Murrelets fly from marine foraging areas to nest sites to exchange incubation or chick-rearing duties with the nest-bound parent. Flights begin as early as 2 hours before sunrise during April-July. The parent then usually remains at the nest until dusk for the next incubation exchange with its mate or until food is brought in. Marbled murrelets prey primarily on near-shore forage fish such as Pacific herring, northern anchovy, Pacific sand lance, and capelin. Fish regularly comprise 60-100% of the diet (Nelson 1997). A small sample of dead murrelets recovered from beaches in Washington and the Salish Sea had digestive tract contents of 80% herring and sand lance (S. Pearson, pers. comm.). Krill (Euphausiacea) is also eaten when fish are scarce. Status and management. 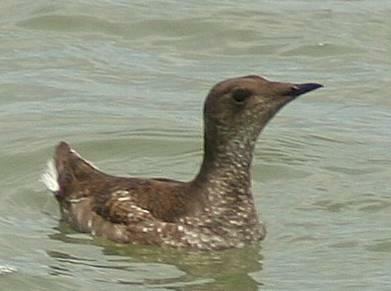 In 1992, the marbled murrelet was listed by the U.S. Fish and Wildlife Service (USFWS) as federally threatened under the Endangered Species Act in Washington, Oregon and California, primarily due to declining population trends and loss of old forest nesting habitat from commercial timber harvesting (USFWS 1992). In 1996, USFWS designated critical habitat considered essential to the conservation of the species in these states. In Washington, all critical habitat was designated on federal lands. The primary objective of the Marbled Murrelet federal recovery plan is to stabilize the population at or near current levels by maintaining or increasing productivity and removing or minimizing threats to survivorship (USFWS 1997). The murrelet was listed as state threatened in 1993 (WAC 232-12-001), and in 1997 the Department of Natural Resources enacted permanent State Forest Practices Rules for the species (WDNR 1997). The rules require forest landowners owning more than 500 acres within 50 miles of marine waters to identify potential nesting habitat and conduct surveys to detect murrelets before any modification or alteration of habitat could take place. If surveys determine there is a high likelihood that nesting is present in a stand, the contiguous habitat is designated “occupied” and is protected from harvest (WDNR 1997). Federal status reviews led by the USFWS (McShane et al. 2004, USFWS 2009) have retained the listing status as federally threatened. This was supported in part by collection of murrelet blood samples from Washington and Oregon (Bloxton and Raphael 2009) The analyses of these samples confirmed an earlier finding that murrelets from the main genetic unit, eastern Aleutians to northern California, are genetically distinct from peripheral populations in the west-central Aleutian Islands and from central California (Piatt et al. 2007). Habitat and population monitoring. Habitat loss and fragmentation was one of the factors leading to population declines of marbled murrelets. Only 5-20% of original old-growth forests remain in Washington, Oregon, and California (USFWS 1997), most of which is in relatively small, fragmented patches or in national forest, parks and reserves. The conservation of nesting habitat is one of the central goals of the recovery plan (USFWS 1997). The interagency Northwest Forest Plan was developed in 1993 to meet requirements to track status and trend of watershed condition, late-successional and old- growth forests, and population and habitat trends for marbled murrelets and northern spotted owls (FEMAT 1993). Trends in murrelet nesting habitat and populations are being tracked over time. Habitat changes are monitored by comparing habitat over time to the 1993 baseline level of nesting habitat (Huff et al. 2006a, Raphael et al. 2006, 2011). Population size and trends are monitored by using standardized surveys for murrelets at sea during the breeding season (Miller et al. 2006, Raphael et al. 2007). The ultimate goal is to relate population trends to nesting habitat conditions (Madsen et al. 1999). More information on the Plan can be found at http://www.reo.gov/monitoring/index.shtml. To monitor the murrelet population in Washington, random transect counts are conducted within 1.5 km of the shoreline to census foraging birds at-sea during most of the breeding season (15 May–31 July). In 2012, the population estimate for Puget Sound and the Strait of Juan de Fuca was 4,393 birds (95% confidence interval = 2,689–6,367 birds), with a 7.43% (standard error = 1.63%) annual rate of decline for the 2001–2012 period (Lance et al. 2013). The population estimate for the outer Washington coast for 2012 (Zone 2) was 1,240 birds (95% confidence interval = 833 – 1,504 birds) with a 7.59% (standard error = 2.01%) annual rate of decline for the 2001-2012 period. As in previous years, higher densities of murrelets occurred from Cape Flattery to the Quinault River mouth than further south. The highest densities of birds were observed from Destruction Island south to Kalaloch and Raft River (Pearson et al. 2011, Lance et al. 2013). 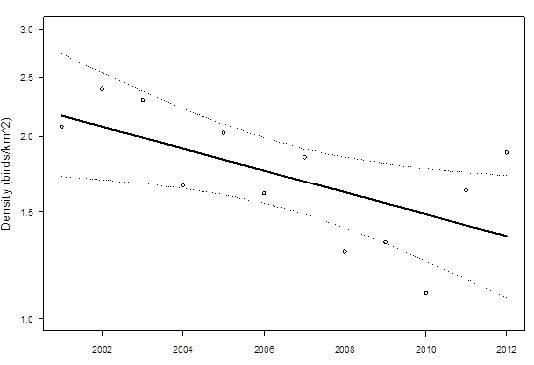 For all of Washington, there was an annual rate of decline in murrelet density from 2001–2012 (adjusted R2=0.3445; P= 0.02632), which represents a 4.07% annual rate of decline during this period (Figure 3; Lance et al. 2013). NWFP terrestrial habitat monitoring. One of the primary objectives of the effectiveness monitoring plan for Marbled Murrelets is to estimate changes in the amount of nesting habitat over time (Raphael et al. 2011). A broad-scale landscape model based on satellite imagery estimated a baseline of 3.8 million acres of marbled murrelet nesting habitat in Washington and Oregon in 1994 and in California in 1996. Most (89%) of the habitat on federal lands occurred within reserved-land allocations. Thirty-six percent of baseline habitat occurred on nonfederal lands. By 2006-2007, about 13% of high quality potential nesting habitat had been lost over all ownerships in Washington, Oregon, and California (Raphael et al. 2011). Fire was identified as the major cause of nesting habitat loss on federal lands in Oregon and California since Northwest Forest Plan (NWFP) implementation, whereas timber harvest was the primary cause of loss on nonfederal lands (Raphael et al. 2011). From 1996 to 2006, model-defined potential nesting habitat in Washington declined by an estimated 252,600 ac out of 2.3 million ac (~11%). Most of this loss (>90%) was attributed to timber harvest (Table 5 in Raphael et al. 2011). Severe windstorms have also contributed to losses of habitat on state and private ownership in southwestern Washington since 2006 (WDNR 2008). Raphael et al. (2002a, 2011) found that murrelet population size is strongly correlated with the amount of potential nesting habitat present, suggesting that conservation of remaining nesting habitat and restoration of non-habitat (i.e., through senescence and conservation of near-habitat stands) is key to the recovery of the species. Nesting/telemetry studies. The Strait of Juan de Fuca and northern Puget Sound have the highest marine densities of marbled murrelets in Washington during the breeding season (Miller et al. 2006, Lance et al. 2013). Adjacent forestlands on the Olympic Peninsula and Vancouver Island provide potential nesting sites for murrelets, especially older forests in or near Olympic National Park, National Forest and provincial parks on Vancouver Island. The Washington portion of this region was the focus of murrelet breeding ecology research (Bloxton and Raphael 2009). From 2004 to 2008, murrelets were captured at sea (Strait of Juan de Fuca, Washington outer Coast, San Juan Islands), radio-tagged, and tracked to inland breeding locations to gain a better understanding of breeding ecology. During this period, only 4 of the 20 nests monitored were successful. Summer home ranges of radioed adults varied from 13 to 7,816 km2 when total marine waters, land areas, and travel corridors were measured (Bloxton and Raphael 2009). Excluding land, the same birds had marine home ranges of 13 to 3,215 km2. Birds with nests located farther from the ocean had larger home ranges. Surveys using radar technology. Land-based marine radar has been used to detect abundance of murrelets during morning flights to and from the sea over large areas. Morning sampling studies have shown that numbers of murrelets detected on inbound flights from the ocean are correlated with the amount of habitat in watersheds, showing the link between at-sea populations and nesting habitat (Burger 2001, Raphael et al. 2002a, Cooper et al. 2006). Perceived population threats. Low murrelet nest success in recent years (Peery et al. 2004, Bloxton and Raphael 2009) is a major concern. At present rates, adult birds are not able to replace themselves. Nest success is influenced by forest structure, the spatial mix of habitat and non-habitat, human disturbance, prey availability, and marine foraging conditions. Human disturbance can lead to higher predation levels by Steller’s and gray jays, crows, ravens, and other species that seek human-related foods and refuse at high-use recreational areas (Peery et al. 2004, Marzluff and Neatherlin 2006). Forest fragmentation can also increase the abundance and distribution of corvids and cause increased predation of nests (Raphael et al. 2002b, Peery et al. 2004). Raphael et al. (2002b) found higher rates of predation at artificial nests within 50 m of forest edge, but the relationship varied with proximity to human activity and structure of the adjacent forest. Predation increased with proximity to edges when the forest matrix contained human settlement and recreation areas, but not when the area was dominated by younger and regenerating forests. Loss or degradation of forests used by nesting murrelets is an ongoing problem in Washington. Damage regularly results from catastrophic winds and smaller storms (WDNR 2008) and can be exacerbated where murrelet habitat is not adequately buffered along its edges (e.g., when harvest of mature trees happens next to nesting habitat). Attrition of potential nesting habitat also occurs from harvest on state and private lands through negotiated agreements (e.g., habitat conservation plans), or in habitat surveyed under Washington Forest Practices Rules (FPR) and not documented to have “occupied” murrelet behavior. Unintended losses of habitat have occurred when FPR-defined habitat is unreported or is not correctly identified on state or private land Washington Forest Practices applications (WDFW, unpublished data). Outside of federal and some WDNR and WDFW state lands, no incentive exists for landowners to develop recruitment habitat to help with murrelet recovery goals. Catastrophic oil spills (e.g., the Tenyo Maru and Exxon Valdez incidents) have the potential to devastate local marbled murrelet populations. Chronic smaller scale oil pollution is also a concern, but is much harder to track. Fishing net mortality, or “bycatch,” of marbled murrelets is currently considered rare in Washington (WDFW Puget Sound Chinook Harvest Plan, Draft EIS April 2004), but is a continuing concern. Only two studies have been done for Puget Sound and represent a small portion of the area sampled. Net fisheries should be monitored closely. The USFWS assembled a team of scientists in October 2011 to investigate causes for the continued decline in murrelet populations. The outcome of these discussions listed many factors, chiefly loss of potential nesting habitat as the main reason for hindrance of population recovery goals. The Pacific Seabird Group is currently reviewing aspects of the 2003 standard terrestrial survey protocol for clarifying delineation of forest habitat, definitions, survey effort, and guidance. Coastal wind energy projects within the range of marbled murrelets in Washington, Oregon, and California have been proposed in recent years. One project with 4 wind turbines has been completed and is now in operation on the Pacific-Grays Harbor county line. The owner is currently devising a monitoring scheme for wildlife impacts. To standardize information to assess potential project impacts, a protocol for using radar technology to survey for murrelets near proposed wind energy projects is currently being developed for the USFWS. The protocol will collect data on murrelet passage rates, flight paths, flight altitudes, and needed survey effort on proposed project sites to help identify risk to the species. Partners and cooperators. U.S. Forest Service (Pacific Northwest Research Station, Redwood Sciences Laboratory), U.S. Fish and Wildlife Service, Washington Department of Natural Resources, National Park Service, Crescent Coastal Research. Bloxton, T. D., and M. G. Raphael. 2009. Breeding ecology of the marbled murrelet in Washington State: five year project summary (2004-2008). USDA Forest Service, Pacific Northwest Research Station, Olympia, Washington. Burger, A. E. 2001. Using radar to estimate populations and assess habitat associations of marbled murrelets. Journal Wildlife Management 65:696-715.
Cooper, B. A., M. G. Raphael, and M. Z. Peery. 2006. Trends in radar-based counts of marbled murrelets on the Olympic Peninsula, Washington, 1996–2004. Condor 108: 936-947. FEMAT (Forest Ecosystem Management Assessment Team). 1993. Forest ecosystem management: an ecological, economic, and social assessment. U.S. Department of Agriculture, U.S. Department of the Interior, National Oceanic and Atmospheric Administration, and U.S. Environmental Protection Agency, Portland, Oregon. Hamer, T. E., and S. K. Nelson. 1995. Characteristics of marbled murrelet nest trees and nesting stands. Pages 69-82 in C. J. Ralph, G. L. Hunt, M. G. Raphael, and J. F. Piatt, editors. Ecology and conservation of the marbled murrelet. General Technical Report PSW-GTR-152, USDA Forest Service, Pacific Southwest Research Station, Albany, California. Huff, M. H., M. G. Raphael, S. L. Miller, S. K. Nelson, and J. Baldwin, technical coordinators. 2006. Northwest Forest Plan—the first 10 years (1994-2003): status and trends of populations and nesting habitat for the marbled murrelet. General Technical Report PNW-GTR-650, USDA Forest Service, Pacific Northwest Research Station, Portland, Oregon. Lance, M.M, S.F. Pearson, M.G. Raphael and T. D. Bloxton, Jr. 2013. Washington At-Sea Marbled Murrelet Population Monitoring: Research Progress Report. Washington Department of Fish and Wildlife and USDA Forest Service Pacific Northwest Research Station, Olympia, Washington. Leschner, L. L., and E. B. Cummins. 1992. Breeding records, inland distribution, and threats of the marbled murrelet in Washington from 1905 to 1987. Proceedings Western Foundation of Vertebrate Zoology 5:42-47. Madsen, S., D. Evans, T. Hamer, P. Henson, S. Miller, S. K. Nelson, D. Roby, and M. Stapanian. 1999. Marbled murrelet effectiveness monitoring plan for the Northwest Forest Plan. USDA Forest Service General Technical Report PNW-GTR-439, USDA Forest Service, Pacific Northwest Research Station, Portland, Oregon. Marzluff, J.M., and E. A. Neatherlin. 2006. Corvid response to human settlements and campgrounds: causes, consequences, and challenges for conservation. Biological Conservation 130:301-314. McShane, C., T. Hamer, H. Carter, G. Swartzman, V. Friesen, D. Ainley, R. Tressler, S. K. Nelson, A. Burger, L. Spear, T. Mohagen, R. Martin, L. Henkel, K. Prindle, C. Strong, and J. Keany. 2004. Evaluation report for the 5-year status review of the marbled murrelet in Washington, Oregon, and California. Unpublished report, EDAW, Inc., Seattle, Washington. Miller, S. L., C. J. Ralph, M. G. Raphael, G. Strong, C. Thompson, J. Baldwin, and H. M. Huff. 2006. At-sea monitoring of marbled murrelet population status and trend in the Northwest Plan area. Pages 31-60 in: M. Huff, M. G. Raphael, S. L. Miller, S. K. Nelson, and J. Baldwin, technical coordinators. Northwest Forest Plan—the first 10 years (1994-2003): status and trends of populations and nesting habitat for the marbled murrelet. Gen. Tech. Rep. PNW-GTR-650, USDA Forest Service, Pacific Northwest Research Station, Portland, Oregon. Nelson, S. K. 1997. Marbled murrelet (Brachyramphus marmoratus). In The Birds of North America, No. 276. A. Poole and F. Gill, editors. Academy of Natural Sciences, Philadelphia, PA, and American Ornithologists Union, Washington, D.C.
Nelson, S. K., M. H. Huff, S. L. Miller, and M. G. Raphael. 2006. Marbled murrelet biology: habitat relations and populations in Northwest Forest Plan—the first 10 Years (1994-2003): status and trends of populations and nesting habitat for the marbled murrelet. General Technical Report PNW-GTR-650, USDA Forest Service, Pacific Northwest Research Station, Portland, Oregon. Pearson, S. F., M. G. Raphael, M. M. Lance, and T. D. Bloxton, Jr. 2011. Washington 2010 at-sea marbled murrelet population monitoring. Research Progress Report, Washington Department of Fish and Wildlife and USDA Forest Service Pacific Northwest Research Station, Olympia, Washington. Peery, M. Z., S. R. Beissinger, S. H. Newman, E. B. Burkett, and T. D. Williams. 2004. Applying the declining population paradigm: diagnosing causes of poor reproduction in the marbled murrelet. Conservation Biology 18:1088–1098. Piatt, J. F., K. J. Kuletz, A. E. Burger, S. A. Hatch, V. L. Friesen, T. P. Birt, M. L. Arimitsu, G. S. Drew, A. M. A. Harding, and K. S. Bixler. 2007. Status review of the marbled murrelet (Brachyramphus marmoratus) in Alaska and British Columbia. U.S. Geological Survey Open-File Report 2006-1387. Ralph, C. J., G. L. Hunt, Jr., M. G. Raphael, and J. F. Piatt. 1995. Ecology and conservation of the marbled murrelet in North America: an overview. Pages 3-22 in C. J. Ralph, G. L. Hunt, Jr., M. G. Raphael, and J. F. Piatt, editors. Ecology and conservation of the marbled murrelet. General Technical Report PSW-GTR-152, USDA Forest Service, Pacific Southwest Research Station, Albany, California. Raphael, M. G., D. E. Mack, and B. A. Cooper. 2002a. Use of radar to investigate landscape-scale relationships between abundance of marbled murrelets and nesting habitat. Condor 104:331-342. Raphael, M. G., G. A. Falxa, K. M. Dugger, B. M. Galleher, D. Lynch, S. L. Miller, S. K. Nelson, and R. D. Young. 2011. Northwest Forest Plan—the first 15 years (1994–2008): status and trend of nesting habitat for the marbled murrelet. Gen. Tech. Rep. PNW-GTR-848, USDA Forest Service, Pacific Northwest Research Station, Portland, Oregon. Ridgely, R. S., T. F. Allnutt, T. Brooks, D. K. McNicol, D. W. Mehlman, B. E. Young, and J. R. Zook. 2007. Digital distribution maps of the birds of the Western Hemisphere, version 3.0. NatureServe, Arlington, Virginia. USFWS (U.S. Fish and Wildlife Service). 1992. Endangered and threatened wildlife and plants: determination of threatened status for the Washington, Oregon, and California population of the marbled murrelet. Federal Register 57:45328-45337. USFWS (U.S. Fish and Wildlife Service). 1997. Recovery plan for the threatened marbled murrelet (Brachyramphus marmoratus) in Washington, Oregon, and California. U.S. Fish and Wildlife Service, Portland, Oregon. USFWS (U.S. Fish and Wildlife Service). 2009. Marbled murrelet (Brachyramphus marmoratus) 5-year status review. Final, June 12, 2009. U.S. Fish and Wildlife Service, Lacey, Washington. WDNR (Washington Department of Natural Resources). 2008. Report on windthrow in southwestern Washington following the 2006-2007 storms. Washington Department of Natural Resources, Olympia, Washington.